Earlier this month, the Texas Supreme Court heard hours of arguments in the latest challenge of the way the state funds its public schools. Now, the big questions — other than exactly how the high court will rule — are when the court will rule and whether the decision will require the Legislature to come back to Austin to craft a fix before the 2017 regular legislative session. Given past rulings and politics — three justices on the nine-member, all-Republican court are up for re-election next year — the consensus among experts and insiders is that a decision will come early next year and likely will require a 2016 special legislative session because it will favor, at least in part, the 600 school districts suing the state. That could mean that a school finance fix is in place before the next school year. For the justices who will be on the GOP primary ballot, “the perfect situation” would be for a ruling to come after that March 1 contest, said Austin-based lobbyist and political consultant Bill Miller. “If I were on the ballot, hypothetically, and I’m a justice, I want the election over with before big, monumental decisions are released,” he said, noting that judicial candidates now are expected to talk more openly about their rulings on the campaign trail. So far, only one of the justices up for re-election — Debra Lehrmann — has a garnered a challenger, but the window to file to become a candidate has not opened yet. (It will close Nov. 14). The other justices up for re-election are Paul Green and Eva Guzman. Past school finance rulings indicate the court is “usually concerned” not with elections but with giving the Legislature time to implement a fix before the next school year or until the end of the next regular legislative session, Pace said. 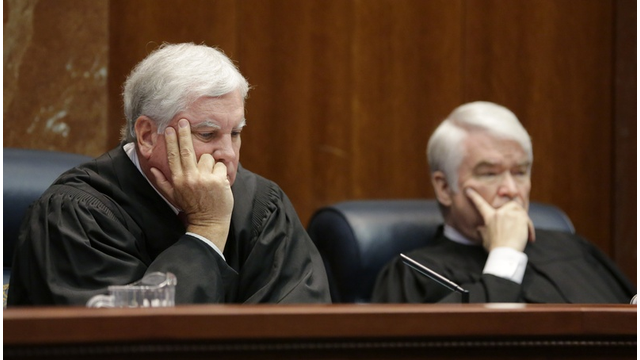 With no legislative session until 2017 — and considering the amount of time the court has taken to rule in the past — Pace is predicting a January 2016 ruling with a fix-it deadline six months after that. The current school finance case is the seventh of its kind to reach the high court since the mid-1980s. In the six previous cases, the court typically has taken anywhere from two to eight months to rule from the time it hears arguments, according to dates provided by the research association. Unlike in the past, when traditional school districts sued the state, this time the challengers include public charter schools and a coalition of parents, business interests and school choice advocates who believe that the traditional public school system is a monopoly. The charter schools say they should be funded the same as other public schools, while Texans for Real Efficiency and Equity in Education says the state's public education system is unconstitutional because it is inefficient and over-regulated. Travis County District Court Judge John Dietz — a Democrat — ruled against the two non-school district parties in 2014, but they are appealing, meaning the state Supreme Court would have to address their arguments to some extent in any ruling. At a three-hour hearing Sept. 1, lawyers for the state asked the court to toss the case — or at least to remand it to state district court given the funding increases and policy changes the Legislature has enacted during the two legislative sessions since 2011, the year school districts sued the state months after lawmakers slashed $5.4 billion from the public education budget. "We are hopeful the court will end this cycle of endless litigation and recognize that Texas' school finance decisions should be made by our Legislature," the state attorney general's office said in a statement. Whatever the court’s decision, political consultants say it could have big political consequences for justices up for re-election. But Olsen and Republican political consultant Ted Delisi, who works for state Supreme Court Justice Jeff Boyd (who is not up for re-election next year), noted that one of the last state Supreme Court justices to garner political scrutiny and opposition over a school finance ruling — now-U.S. Sen John Cornyn — emerged unscathed. In 1996, the year after the court approved a Cornyn-crafted decision that upheld the divisive "Robin Hood" plan, he won re-election by a healthy six-point margin, beating out two challengers in the November general election. It is difficult — and pointless — to anticipate the political consequences of a school finance ruling, Delisi said. “I think the very best Supreme Court justices are the ones that make their determination according to the law and then figure how to make a case to the voters that their competency or their conservatism is worthy of re-election,” he said.